In late 2000 and often during 2001 and early 2002, there were shooting incidents near the tomb that closed the site for much of that time, once again bringing Jewish visitation to a trickle. The tomb was reopened in about 2003, and a security wall was constructed around its periphery, but few at first made the journey. Then a Jewish Israeli couple, Rabbi Moshe M. and Mrs. Bluma Kluger, personally intervened. 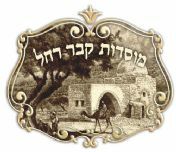 They founded Rachel's Tomb Institute (Mosdos Kever Rachel), a group consisting of the Klugers, and a few volunteers, that has facilitated tens of thousands of visits to the tomb. Rabbi Kluger engaged in a fund-raising campaign and also took out personal loans to fund five private, bullet-proof buses per weekday that make stops throughout Jerusalem for those wanting to pray at the tomb. The Klugers can be found daily at Rachel's tomb, routinely escorting new visitors who say they are nervous about traveling into the Palestinian neighborhood. Mosdos Kever Rachel also renewed learning at Rachel's Tomb by helping to establish a Yeshiva, which offers daily classes and leads prayer services in the afternoons and evenings. Mosdos Kever Rachel holds special events each month for the general public and personally serve food to Israeli soldiers stationed at and around the tomb area. Mosdos Kever Rachel has raised some money, but has gone into substantial debt with bus payments nearing several hundred thousand dollars. They say the satisfaction of keeping the tomb alive is more than worth their monetary efforts. "Thankfully, Rachel's Tomb is busy again and cannot be put aside or given up,"
The institute also opened a hotline in Israel and in U.S.(1-888-2ROCHEL (76-2435), taking calls 24-hours-a-day from those around the world in need of a prayer at the tomb. Individuals can sponsor a day, week or month of learning, or the recital of the entire Sefer Tehillim in their honor. "The stories we have seen through the hotline are just unbelievable,"
"One time there was a man terminally ill with cancer. He was beyond treatment and the doctors really said he had almost no chance. A family member remembered we were involved with Rachel's Tomb and quickly sponsored a whole month of learning, plus reading of the palms. Exactly two days after the month, he was cured and walking around. My husband was absolutely amazed..."
"I was very touched when once a woman was in labor for many hours and the baby couldn't be delivered properly. They were starting to get scared, and called my husband who happened to be at the tomb. A prayer was quickly said, and minutes later a healthy baby was delivered." Meanwhile, Rabbi Kluger says they will continue their efforts "For as long as it takes. The Jewish people will never forsake our mother Rachel."